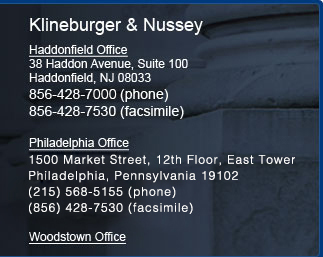 With offices in Haddonfield, New Jersey, and Philadelphia, Pennsylvania, the law firm of Klineburger & Nussey represents clients in both states who are seeking legal advice in the practice areas of criminal defense, family law, and civil litigation. If you are seeking the services of an experienced lawyer to help resolve your personal and legal needs, please call our law firm at (856) 428-7000 to schedule a Reduced Rate consultation or send us an e-mail. Our attorneys leave no stone unturned when building cases for our clients. They have extensive trial experience and have helped set legal precedent in certain high-profile cases. Richard F. Klineburger III is a certified criminal trial attorney, while D. Ryan Nussey is a certified matrimonial law attorney. Furthermore, Richard serves on the Board of Directors of South Jersey Legal Services, which provides pro bono legal assistance to the underprivileged and the elderly. Richard is also the Solicitor of Haddon Township while Ryan serves as the President of the Salem County bar Association as well as on the District IV Ethics Committee. Founded in 1997, our law firm has served the legal needs of our community for a decade. Backed by a strong and effective support staff, our clients receive close personal attention throughout the duration of their case and always have direct access to our offices. As a small boutique firm, we achieve the kind of results clients would expect from a large firm, while also providing them with a high level of personalized service. Please contact us for the legal counsel and individual attention you deserve in resolving your issue.